Hello friends! Happy hump day! 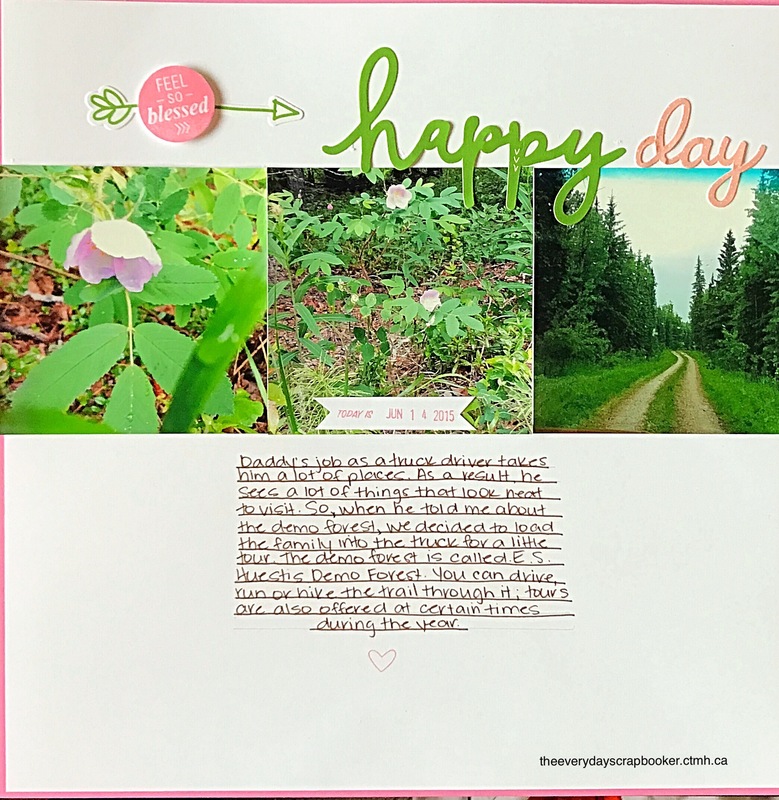 It was a rainy day here in my neck of the woods, which made the day perfect for more scrapbooking! As promised, I would share projects featuring this months stamp of the month, Feel So Blessed, and I’m happy to report that I have a couple to share with you! I have three to share with you, as a matter of fact! This last layout features an eclectic mixture of products from CTMH- I used the stamp of the month, journaling cards that I had left over from the Charlotte collection, and some of the paper accents came from the Adventure Cut Above layout kit. I absolutely love how this layout came together! The middle layout features left over complements from Some Kinda Wonderful and the stamp of the month. I also layered my White Daisy card stock in front of the Smoothie card stock for a pretty (and simple) border statement. 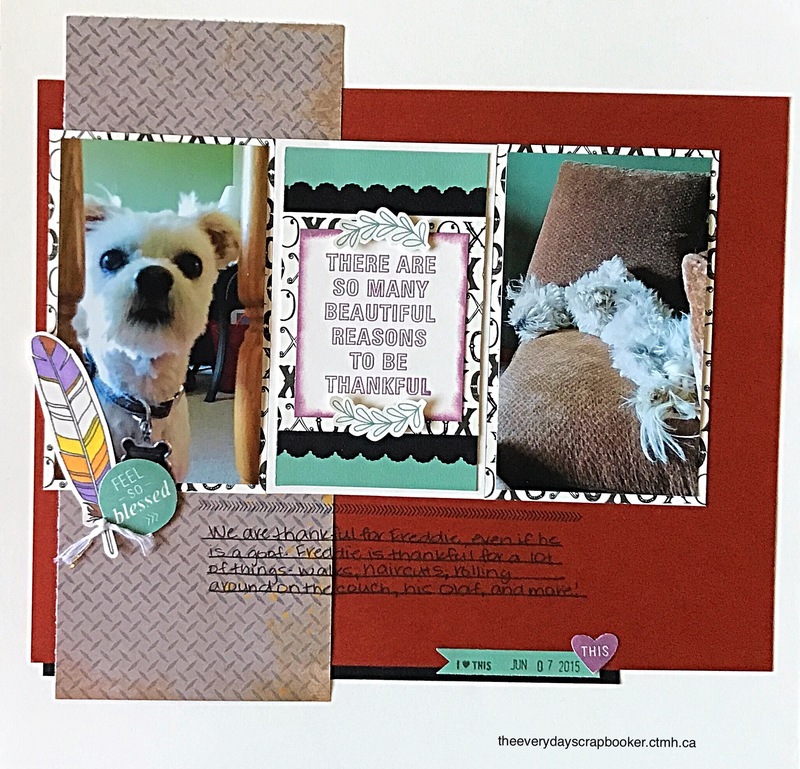 Lastly, I used Recollections patterned paper (of which were scraps) along with CTMH card stock and Urban patterned paper to create this layout about my doofus Freddie. I coloured the feather image in using my Shin Han Touch Twin markers. Which is your favourite? I think there’s something special about all three layouts, but my favourite two needs to be the last two I shared. Its all the white space…it just speaks to me. This months’ stamp of the month speaks to me, too. Its wonderful to use for all those Thanksgiving layouts that will soon be gracing craft galleries and Facebook pages all over the internet. I’m also seeing it being used to decorate fall themed layouts and projects. I took a less festive approach to my use of this stamp set, but it just goes to show how versatile it really is! Have you thought of any other ways you’d use it? Let me know in the comments below!